One thing that is super important to me is feeding my kids healthy, fresh and nutritious options daily. I think that in order for our bodies to fight off all the germs that kids naturally just share and spread around, we have to make sure we are feeding our kiddos (and us) WHOLE foods consistently. This doesn't mean we don't eat sweets, carbs or treats. We definitely get our fill of yummy goodies. But I've always encouraged my kids, that in order to remove the guilt from treats, you need to fill the core of your diet with whole foods. So how do I stay on top of good nutrition for all 6 of us in our household? It's simple...I prepare in advance. Grocery Shop ONE day per week // I plan our meals out for one week before I shop, then buy what I need. In the beginning of the month, I buy or normal fruits, veggies and meats. But then I also stock up on all the lunch items, pre packaged items for on the go and snacks. Then ONE day per week after that, I get fresh fruits and veggies. Re-Create your favorite "fast food" options for lunches // I try to think of what we like to eat when we are out and about and then recreate. When I say "fast food", I don't mean McDonalds. (We don't eat that crap). Our favorite "On The Go's" are Panera, Salad & Go, Chick-Fil-A and Chipotle or Cafe Rio. Each of those restaurants has super healthy options. So for the kids lunches, instead of just sandwiches each day, I try to mix it up. "Taco Kit's" with all the toppings such as guac, cheese, lettuce, pico, and a meat + a tortilla and let them build their own taco at school. They LOVE this one. We do lots of salads or "salad bar" in their lunches so they can put their salad together. And Sometimes, I will just go and get a small tray of nuggets from Chick-Fil-A and put them in their lunch with some fruits and veggies. They get so excited! Pack Lunches the Night Before // And for the WHOLE family. I pack my school aged kids lunches, but I also pack my 2 year old lunches even though she is home with me. It makes it way easier just to grab her prepped lunch out of the fridge and set it down. Especially working from home and having a newborn at home. I like to have my lunch prepped too, otherwise I honestly will just eat crap food or not eat at all. I love these containers to prep everyones food in. Prepare Some Items For the Whole Week // I am NOT a morning person. And my kids have to be awake at 6am. Instead of cooking an entire breakfast, each day, that early I cook sausage and bacon for the whole week at the beginning of the week. That way I can just cook an egg really quick or they can have some breakfast sausage and fruit and be done with it. Every once in a while I will bake an egg dish or a quiche for the week. This cuts out the sugary cereals and saves me so much time each week. 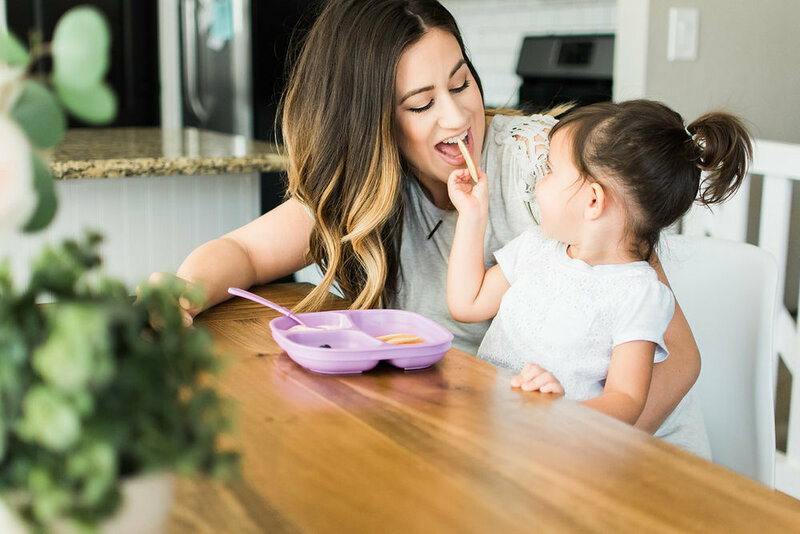 The One Bite Rule // This is a rule I have always had with my kids. They have to take ONE bite of whatever is on their plate. The rest is up to them. And I do this for a few reasons. #1 - I want them to broaden their palettes and be open to trying new things. #2 - I want to continually expose them to different foods #3 Their tastebuds change, so although they might not like sweet potatoes at one point, they might like it later down the road. I provide, They Decide // I provide them with healthy and nutritious meals, and they decide how much they want to eat. Now, this does not give them permission to skip dinner and snack the rest of the night. Their dinner is their meal and I am not going to offer them anything different to eat. But I always try to put SOMETHING on their plate that I know they will eat. For the most part, all my children eat great. My son is the pickiest, but he does have is "go-to's" such as avocado, broccoli, any kind of sausage and sweet potatoes. So if I know I am making something new, and I'm not sure he will like it, I try to put one of his favorites on the plate as well. So, if he only has one bite of salmon and brussel sprouts, its ok because I know he just ate a whole sweet potato and some broccoli. Which are both great options for him to eat. Also, I want my children to listen to their bodies. And if their body is saying they are full, then I am not going to force them to finish their meal. (And they know they can't grab snacks after dinner if they haven't eaten a "proper" meal or enough to fill them up). 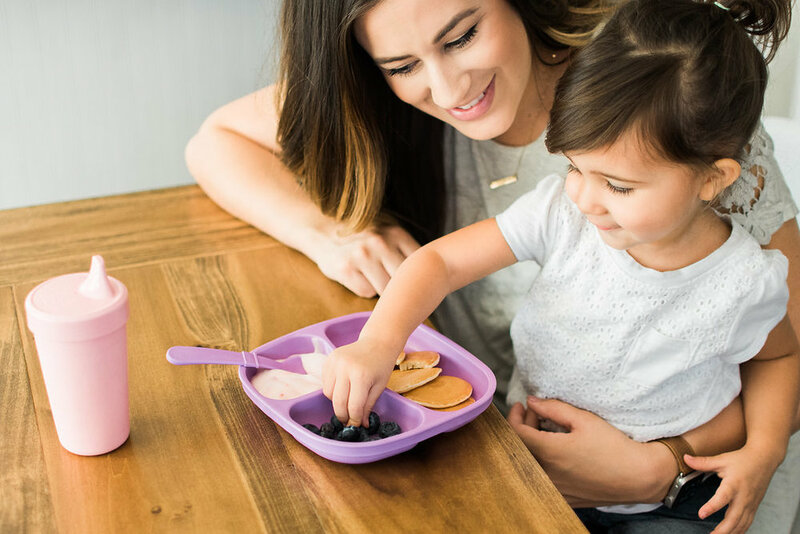 Separate Their Food // I have learned that kids sometimes get overwhelmed with too many things on their plates, their food touching or too big of portions. I LOVE the Re-Play divided plates. The kids eat every meal off of them. They have the divided plates which work out perfect to separate the smaller portions and different foods. I would rather have my kids ask for more food, then to have to throw a ton of food away each night. Only Cook What Servings You Will Eat // We are not big leftover people. So I cook for how many people I am feeding. Most meals, we don't have any food left over, which cuts down on waste. (I HATE throwing food away). Don't Stress + Have Grace on Yourself // Sometimes my kids get an uncrustable for lunch. (Sometimes mommy and daddy steal them all because we are actually addicted to them) Guess what...It's ok. Its actually more then ok. We grew up eating crap, at least I did. I loved a good Hot Pocket for breakfast before High School each morning...plus fast food for lunches. (GROSS). But I always try to throw in a fruit and veggie with each option. One to two times a month, I get my kids a Lunchable. (Even more gross). But they LOVE it. And I don't want them to binge on that food when they are at other peoples houses because they don't get it at mine. So although our core meals are good, we eat the crap too. Now, if you got through that whole blog post....you are amazing. That was a long one! Ha! Comment and let me know your thoughts and head to INSTAGRAM for a giveaway with Re-Play!! We teamed up and are giving away a $35 E-GiftCard to get your very own set of their amazing products!